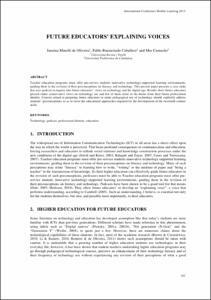 Minelli, Janaina; Buenestado, P.; Camacho, M.
Teacher education programs must offer pre-service students innovative technology-supported learning environments, guiding them in the revision of their preconceptions on literacy and technology. This present paper presents a case study that uses podcast to inquiry into future educators’ views on technology and the digital age. Results show future educators present rather conservative views on technology use and few of them relate to the theme from their future professional identity. Courses aimed at preparing future educators to make pedagogical use of technology should explicitly address students’ preconceptions so as to favor the educational approaches required for the development of the twentieth century skills. Minelli, Janaina; Buenestado, P.; Camacho, M. Future educators' explaning voices. A: IADIS International Conference. "Proceedings of IADIS Mobiles Learning". Lisboa: IADIS Press, 2013, p. 143-147.